As we move through our experiences and processes, there are times when confusion and feeling lack of clarity on the direction to take, will step in. This may be something you are experiencing now, especially during these times of Mercury being Retrograde. And in general, since many are in the midst of making huge shifts and taking leaps in their life, there can come periods of temporary “void” where things feel stagnant, like you’re floating in the abyss, you may feel discouraged, or perhaps even lost. If treated and fueled with fear, anger, frustration, and disappointment, this will add to the confusion and create further inner turmoil. But if we can accept this as a natural current of energy that simply is moving through us and going through its seasonal changes and temporary growing spurt pains, we can honor our processes and take more conscious, present, and nurturing steps that will support and lift us up and through the journey, rather than have us getting stuck and sinking deeper in the quicksand. Sometimes it simply is about taking a break, stopping everything else, and being still so you can hear the answers more clearly. 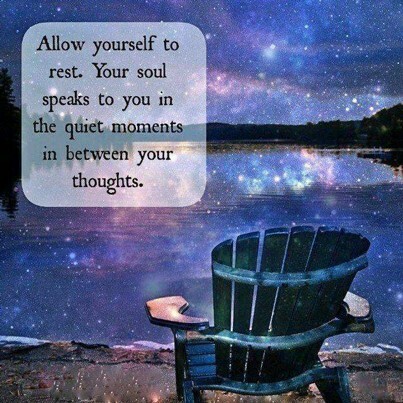 Rest will also help clear your thoughts and refresh your outlook on things. Recharging in nature and spending time alone with yourself so you can get rebalanced will supply you with more centered vibrancy that helps you to also be more acutely aware of things that are not aligned with the natural you. Focusing also only on the here and now and the immediate steps and action you can take, rather than looking at the the wider picture (which has the ability to overstimulate while you torment yourself with trying to figure out how in the heck you’ll get to this destination you’re focused on), will decrease and release the tension, stress, anxiety, and self-created pressure. If you’re not sure on the direction to take, make a list of your goals and prioritize what things you can do now that feel joyous and aligned with your frequency, are easier to implement, and that will keep you moving forward. Don’t attach to the specific outcome, but really hone in on the essence of what you are creating. This way you can focus on enjoying the journey, while supporting your intents. And by taking it a day at a time, you will also be open to where those steps lead, which may unfold in a completely different, but even more fulfilling way than you could have imagined. I have come to accept the feeling of not knowing where I am going. And I have trained myself to love it. Because it is only when we are suspended in mid-air with no landing in sight, that we force our wings to unravel and alas begin our flight. And as we fly, we still may not know where we are going to. But the miracle is in the unfolding of the wings. You may not know where you’re going, but you know that so long as you spread your wings, the winds will carry you. ~ C. JoyBell C.
Stop over-thinking and analyzing. This creates stress and anxiety and takes you out of the present moment and out of your heart. It can leave you feeling defeated before even starting. It’s supportive to have wise discernment with things, but when you allow your mind to run wild, then wild it will run you! You will find yourself drained and burned out. All we can do is manage what is in front of us currently. The future will unfold, as we take loving and empowered steps in each moment toward the things we want. The here and now is most important and when you focus just there, you will be able to recognize the possibilities and opportunities that present themselves, rather than miss them because you were focused “out there”. Don’t wait until you “think” you have the perfect action and idea. Just do anything that feels good right now to do. This will immediately help to shift your energy, to become more enthusiastic, to fuel your passions, and to feel better in general with more positive outlooks. You have the ability to empower yourself with every day choices. And every time you take a step forward, you are showing the Universe you are serious about the things you are asking for and wanting, and it will create a momentum that unfolds more and more synchronous experiences that will assist the journey. Listen to your heart and inner voice of intuitive guidance. Let go and trust more and more that voice inside of you that nudges you gently toward your joys. You know that saying, “you’ll see it when you believe it”. It doesn’t work the other way around. So start believing in yourself and trusting the feelings you have that will guide you to the results you desire. Take those chances and the more you do, it gets easier and easier to take the bigger steps. Plus you’ll be learning and growing, expanding your abilities and not waiting around, but taking action in an empowered way. And realize that you have unique gifts that are wanted and needed in the world. Support them and bring them into every thing you do. Focus on your own voice and do things the way that feel right to you. Not the way others do it, or how others tell you is the way to do it. There is no one way. There is simply you being you and you supporting you in every moment. Clarity will come, the more you allow yourself to be ready to “see” yourself, voice yourself, and bring forth who you are, more and more through your life expressions. Be patient, kind, and loving with your journey, as there is no time frame to accomplish things by. They just don’t let these feelings stop them. Posted on February 20, 2014, in Uncategorized and tagged creating clarity in your life, how to find direction, navigating through change and confusion, when you feel lost. Bookmark the permalink. 4 Comments. Thank you Tania for this post. I really enjoyed reading it. It really triggers a lot of thoughts and is a good reminder..to focus on the big picture. Great post. A friend recommended and it came at the perfect time. Thanks for putting it out in the world.